I realise there will be some measure of eye-rolling and cynicism towards this post, and thats fine – but this blog is about trying new and interesting things in London so I wanted to write about my recent tarot-reading experience. Diana Taylor is a tarot consultant and teacher who reads tarot cards daily at Treadwells bookshop. A friend of mine recommended her (she was amazed at how many of Diana’s predictions had come true) and, being a naturally curious person, I wanted to try it out myself. Treadwells bookshop is an amazing place. It calls itself a “magical bookshop” specialising in all things esoteric. There were books on magic and witchcraft, tarot and crystals, goddesses and gods, as well as candles and herbs and oils and jewellery. Oh yes and wands (cue more eye-rolling!). I’d recommend you pop in to take a look because its a really interesting place and you may pick up a brilliant book (I was tempted by the female goddess ones…). In any case, Byron Burgers is just around the corner so I will certainly be back nom nom. I was a little nervous, but Diana is a naturally friendly person. Although my initial list for discussion was fairly full, like most women, I wanted to concentrate on love. 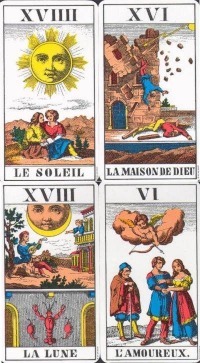 I have to be honest and say that I have no idea how tarot works. I didn’t put a huge amount of thought into what cards I picked and don’t understand why picking a card reveals truths about you. But Diana referred to certain specific problems that surprised me, and to certain aspects of my personality that are hidden from most. Whether or not I understood it, it gave me comfort on certain issues, made me think about problems and myself in new ways, and I felt really postive when I left. And in October I’m likely to be even more happy 🙂 (don’t panic El G!). Fact is, if you have worries, you sometimes feel you’ve reached a brick wall. So if you have the time and an open-mind, this is a great way of exploring new angles of your life, and new ways of seeing things. Importantly, Diana is an incredibly warm, helpful force – she certainly managed to get thoughts and ideas out of me that most people can’t. You can contact Diana for a tarot-reading session which costs £30 for 1/2 hour and £50 for a full hour – call 0207 240 8906 to make an appointment (and mention the HPL!). She also runs courses if you want to understand it all a bit more. This entry was posted in 6. BE CURIOUS - thoughts on happiness, psychology, love and the world and tagged Diana Taylor, tarot reading in London, Treadwells Bookshop. Bookmark the permalink.